Our Culture & Community placement in South Africa is based in vibrant Cape Town. As a volunteer, you will work in a group alongside other like-minded people your age and spend two weeks making a positive difference in the lives of locals. This particular Grown-up Special is ideal for those aged 50+ who are looking to experience something completely different and travel with purpose. During your time on this placement, you will spend your mornings assisting with ongoing building work in a local township, under the supervision of a building manager. 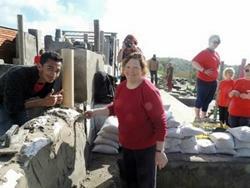 Volunteers are currently working on building a multi-purpose community centre. Duties may include helping to mix cement, plastering and painting. In the afternoons, you have the opportunity to join in on other community programmes, such as our nutrition project. This particular initiative involves working in the organic vegetable garden, educating people about the importance of organic food production and basic permaculture techniques, and preparing meals for the local children. Volunteers will also spend time with the children, and help run sports activities with them. During your time in Cape Town, you will stay with a host family, which will allow you to become fully immersed in the local way of life. Together with the other volunteers, you will have the chance to explore some of the city’s popular attractions, including visits to Table Mountain, Kirstenbosch Botanical Gardens, and the historic Robben Island.